Broken bones and fractures in kids are different than those in adults, due to the fact that bones in children tend to be softer and more flexible. A common wrist injury in kids is known as a “buckle fracture”, also sometimes referred to as a “torus fracture”. While adult bones tends to crack like a piece of chalk, the forearm bones (radius and ulna) of kids tend to “buckle”, or collapse and deform like a piece of Play-Doh. When treated appropriately, these fractures almost always heal uneventfully, with no long term effect on growth or function of the wrist. Buckle fracture of the wrist (radius bone) in a child. A dent is seen on the back side of the bone (right image). This is like pushing your thumb into an empty paper towel roll - a dent is made but there is no complete “break”. Pain and swelling of the wrist are the most common symptoms. Kids will tend to avoid using the injured wrist. They also tend to withdraw the arm due to pain when the wrist is touched or pressure is applied. Sometimes symptoms are relatively mild, and occasionally there will be a delay of a week or more between the injury and evaluation, as parents wait to see if their child improves following a suspected “sprain”. X-rays are essential for diagnosing a buckle fracture, and will show a disruption of one of the surfaces of the bone. The vast majority of buckle fractures can be treated in a cast or removable brace. A buckle fracture of the wrist typically takes 4-6 weeks to heal. The younger the child, the more quickly the bone heals. Typically, a repeat x-ray will be taken approximately 4-6 weeks after the injury. Once the "buckle" has filled in with bone, and when the child no longer has pain when pressure is applied to the area, the splint or cast can be removed. For the first week or two after cast removal, it is often advised to avoid higher risk activities such as playgrounds, scooters, bikes, and sports without a splint in place. Example 1. Left: A buckle fracture of the wrist is an indentation in the bone. Center: After one month, new bone can already be seen that the body has added to the indentation site to stabilize and protect it. Right: After two months, the bone looks completely normal on x-rays, a process called remodeling. While most buckle fractures of the wrist heal uneventfully, some wrist fractures in kids may need to be set. The degree of “displacement” (the shift or angulation of the bone pieces), along with the child’s age determines the ideal treatment. Older kids (>10 years old) have less ability to "remodel" the bone. The older the child, the less time available for the bone to straighten itself out with normal growth. 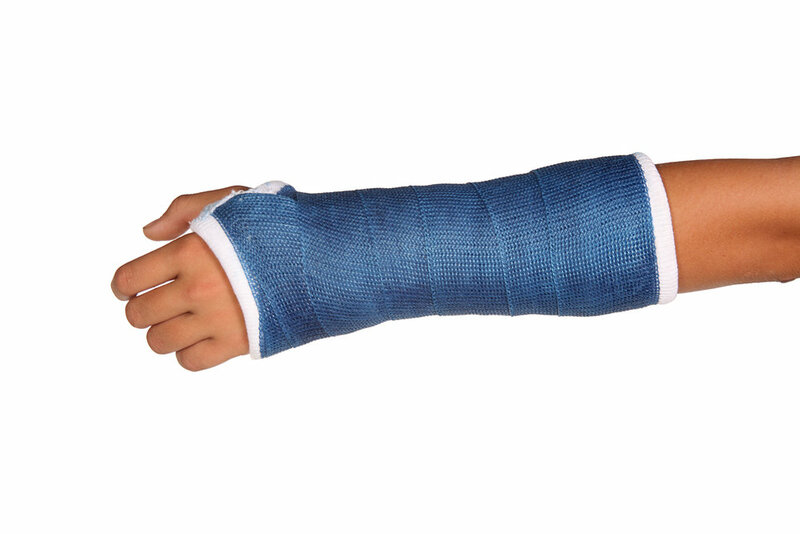 Minimally displaced fractures usually heal uneventfully in a cast or splint. Occasionally, the fracture fragments are shifted or notably angled. In these cases, setting the bone may be required to minimize growth disturbances and optimize function of the hand going forward. Throughout treatment, it is important to continue to move the fingers to prevent stiffness and minimize swelling. After the fracture heals, therapy may occasionally be needed to recover motion of the wrist, strength, and function. In general, kids tend to recover their motion and strength much more quickly than adults, and most kids are back to themselves after a couple of months. Example 2. Left: more severe fracture that extends completely across the radius bone. Right: Healing after 6 weeks, showing a new layer of bone formation around the fracture. With more time, the fracture will disappear, as the new bone blends into the old bone.